One week you’re having a blast with “Bottles” Capone…next week you’re…. The Spin: Betrayal, dishonor, broken families and broken hearts were the themes of tonight’s richly composed Korder penned episode. As one of the empire’s dearest characters sang his swan song, Van Patten directed with a heavy Coen-esque pall in one of the most hauntingly photographed hours in the series history. 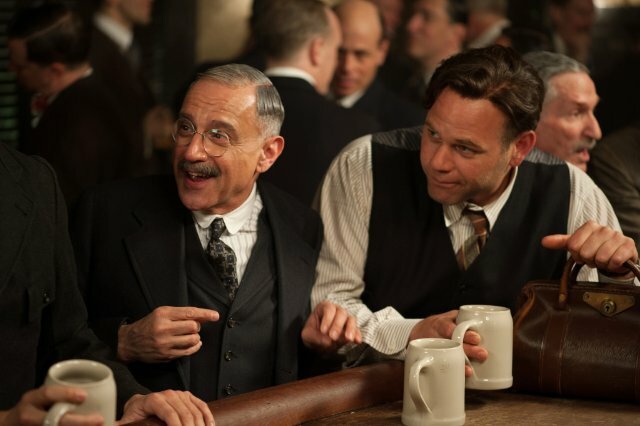 Eli’s dumb son plotline finely blossomed into something of substance, as Willie is brought in for questioning regarding his schoolmate’s gruesome poisoning and reaches out to Uncle Nucky in his time of need. The Nuckster, always calm under stress, crafts a deal with the DA that involves Willie selling his innocent roommate down the river. He ends up with a sweet crying gal in his arms, but he couldn’t be more torn up on the inside as he realizes the life he wanted is full of heartache, lies, death and an Uncle who will always be calling the shots. Meanwhile, Gillian (Gretchen Mol – once again signing a letter to the Emmy voters – I mean, seriously, how has she not been nominated yet?) reaches rock bottom with her dope addiction as the Tommy custody case seems to be coming to a close and is not going her way. Mol imbues so much nuance and nerve into her performance, you actually find yourself feeling sorry for Gillian, as if the poor girl after all she has been through can’t help herself…could never help herself…and Piggly Wiggly Roy (Ron Livingston) asks her a dangerous question in his sincere play to take care of her and help her find redemption. But oh boy, Roy, I don’t know what you’re going to do if she ever tells you all the horrible things she’s done. Out in Cicero, a bloody one-sided shoot-out leaves the Capone gang down a man and Muller in deep. However, the melancholy hour belonged to Eddie (Anthony Laciura) who in asking for too much from Nucky got himself into a pickle with the Feds, who broke him down through sad talk of his family left behind in Germany and made him betray his only family on these lonely shores, only to walk home battered and broken and get scolded by Nucky for leaving out mismatched socks. Cue the violin, the open window and the drapes blowing in the sea breeze. Goethe’s “Erlkonig” poem was used to great effect, continuing the series’ penchant for using literature (especially stories of a fantastical nature) as a mirror on the tragedies unfolding. Wait for Next Week: Uh, the Fed’s case is literally blown out the window, so watta they gonna do? Hope we get back to Florida for a spell. This entry was posted in Boardwalk Empire: Complete Episode Guide, Pop Culture, Television and tagged Anthony Laciura, Atlantic City, Boardwalk Empire, Boardwalk Empire Blow by Blow Episode Guide, Erlkonig, Gangsters, Goethe, Gretchen Mol, HBO, Howard Korder, Prohibition, Ron Livingston, Steve Buscemi, The 1920's, Tim Van Patten, TV Series. I really do need to return to this series now that I have finally finished THE WIRE and am nearing the end of BREAKING BAD.